I've not posted in a long while. 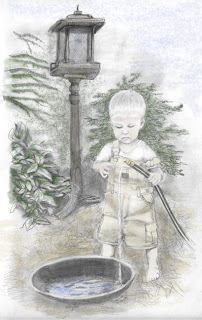 I had been busy with music, a new etsy store, and CD editing so my blogs went to the side for a while. And then, last July I had a serious car accident. I was hit head on by someone who was asleep at the wheel. 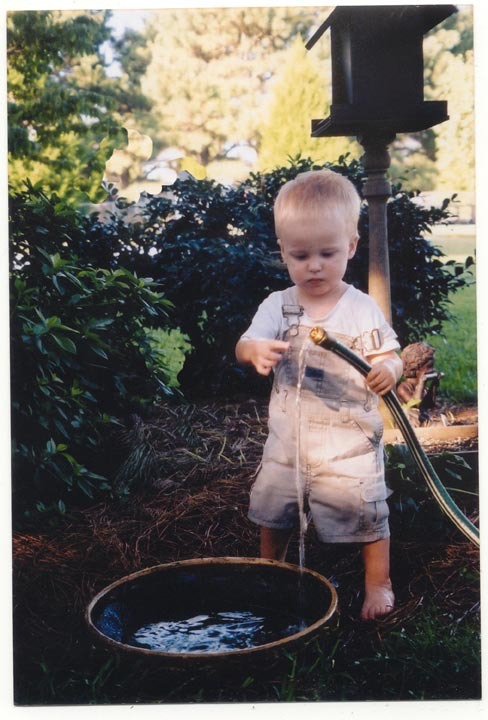 I was not a pretty sight. I received fractures to the left side of my face, a huge hemotoma to my arm and immediate damage to both eyes due to the impact to my face and the shaking effect. I was hit head on at 60 miles per hour and then hit behind as well. Although my face and arm still hurt, the worst is the damage to my eyes. However, I can still see, although blurry and fragmented most times. And since you are not here to hear about my injuries let me put a little eye candy up with things that I had made before the accident. 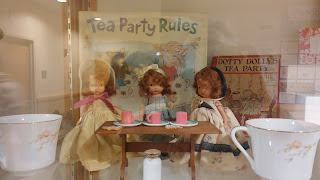 Me and another lady organized a "Dolly Tea Party" at the local pubic library for children and their dolls They allowed me to 'dress' the window box for advertisement as well as make large posters I adhered to foam core board to place around the library. 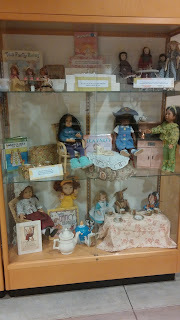 The window case had sweet antique, vintage and modern dolls along with books about dolls and tea parties. The tea party was a great success. We had over 25 attendees plus their parent. 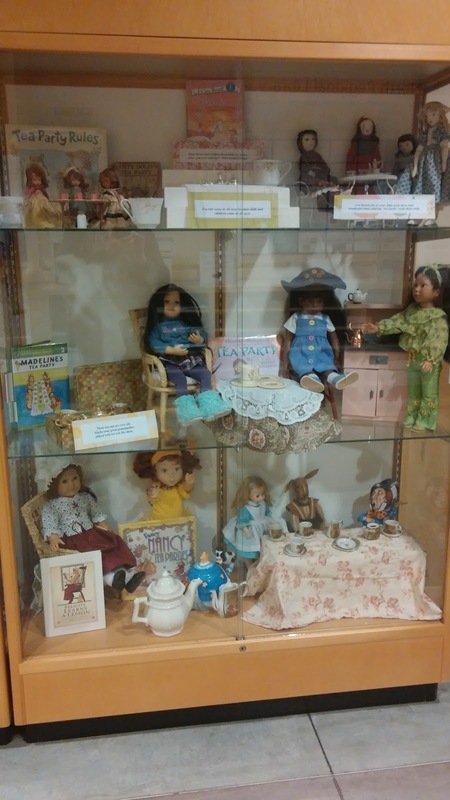 Our UFDC doll club donated so many door prizes that every child received a door prize. It was a smashing success and the librarians asked when we could do it again. It was a LOT of hard work. We purchased and prepared all the food, decorations and table favors ourselves. So we did not intend to do it for another year. But my issues with the accident and other things has put it off another year. 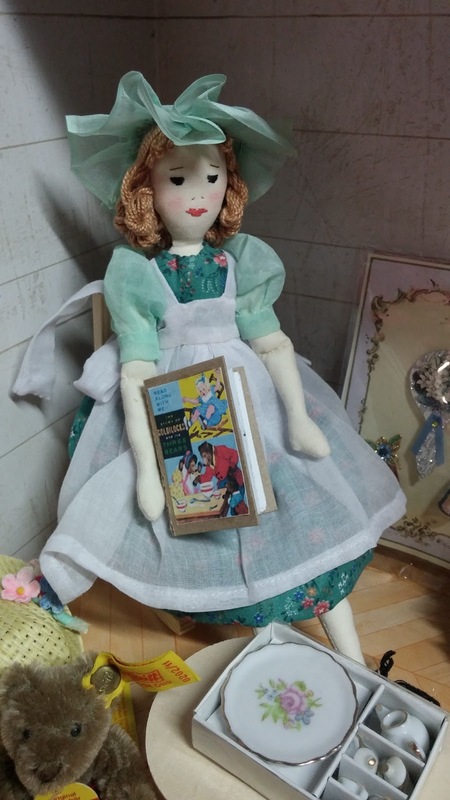 I also made another doll that was sent to the UFDC convention as a helper. My friend Cheryl Phillips who also helped with the tea party made her a large box for a trunk that opens into a play room. We added a rocking chair, a bed, clothes, quilts, toys, books, so many things. This is a picture of the doll before she had shoes. And this is a picture of her with some of her goodies. 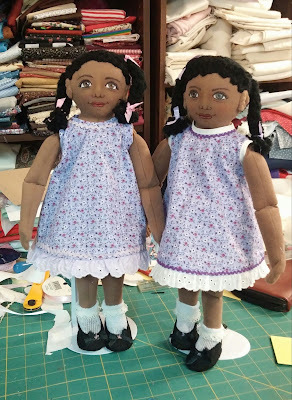 Later (but still before the accident) I made two sweet twin dolls for two sweet twin girls at my church. I used my own pattern design "Lacey" which you can find in my etsy store Pollywoggle Lane.. or on my website Pollywoggle Lane. It came out really sweet. I think I made it just a little bigger than the pattern. I even made their shoes, which those of you who know me know that I love to make shoes but rarely get the chance to do it. I even painted little hearts on their chest with the names of the girls under them. I need to make them more clothes for their girls so they can play dress up. Maybe soon. Thought I would share a cute little idea I had while my granddaughter was staying with me. She got this little bear at McDonalds and told me that she had a couple already. I asked her if she wanted me to make it into a Christmas ornament and she said "yes". So I decided to share the process. 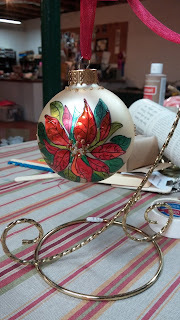 Many things can be made into ornaments. Some things would need to have a hanger glued to it but since this was cloth it was easy enough to sew a hanger to it. First , I removed the tag. No one wants a tag hanging off their ornament. Then we need to sew a hanger to the top of the bears head. I made a knot in my thread and stuck the needle into the back of the bear head. It doesn't matter where you stick it.... the knot is getting cut off before we are done and you won't see the entry point. So you can see that I entered at the back of the head and came out at the top. Then I make a couple of small stitches one on top of the other. This sets the stitch so that I can cut the knot in the back without the thread pulling loose later. Then find something you woud like to use as the hanger. I like this little gold cord. So I made a knot in it to form a loop. And I sewed this to the top of the bear head. I made a few stitches to hold the cord on securely and then I was ready to sink the thread and hide the "tail" of the thread. Just like in the beginning when I made a couple of small stitches to secure the thread so I could cut the starter knot, I did the same so I could then run the needle in at the stitches and then out farther away where I will cut it close to the head and you will no longer see the 'tail' of thread. And now it hangs securely and can go on the tree. 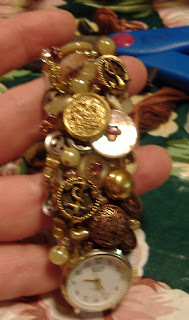 Then I found a little bead wreath that looked good with the bear and I stitched it to the arm of the bear. But even without the wreath it was cute enough for the tree. I had posted some of the pictures of last years State Fair entries. Now for some pictures of this years fair entries. I submitted 29 entries and got 19 ribbons. These are just a few that I could find pictures for easily. 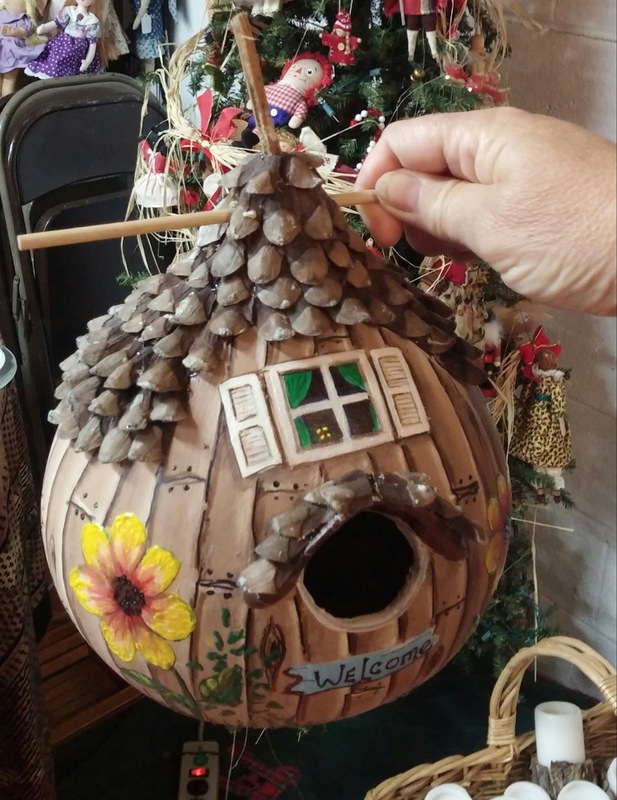 A gourd birdhouse. Got 1st place. 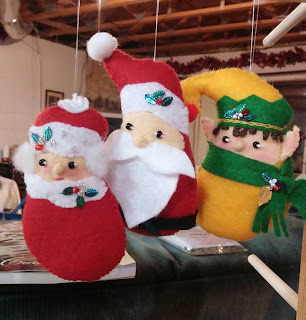 Three little felt Christmas ornaments. Got honorable mention or something like that. This is an owl on a pumpkin made from one gourd. 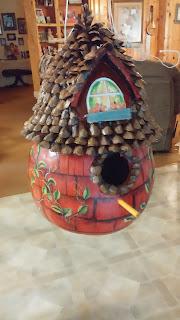 I used paper clay to make the additions and pine cone petals for the tail. 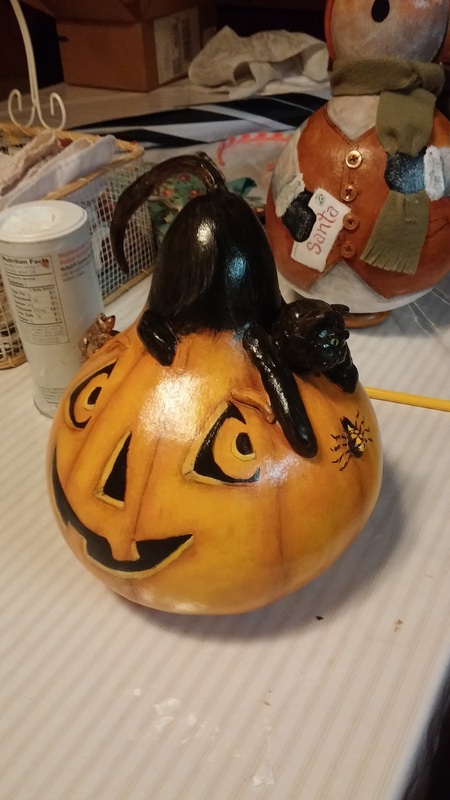 It was entered into a "painted gourd" category. It got 1st place. This is another birdhouse that got 2nd place. I really enjoyed making this card. It did not get any ribbon. But I had fun. 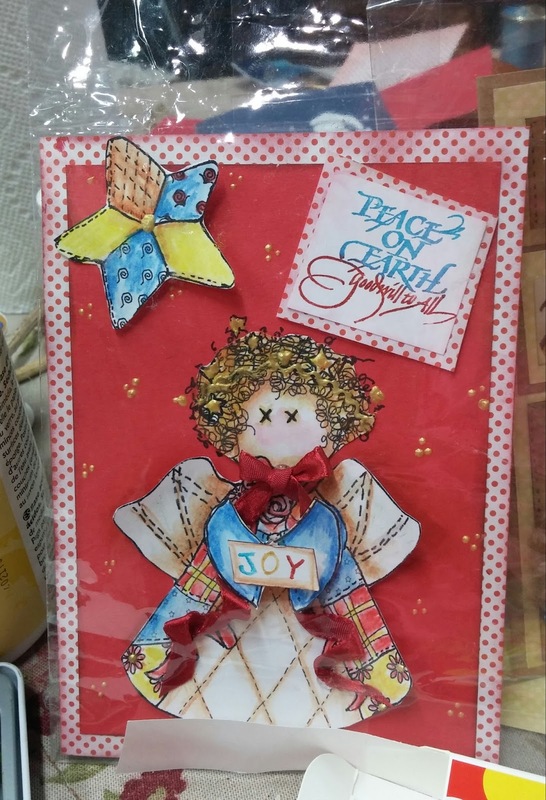 And someone will get a sweet card for Christmas. This was my favorite piece. 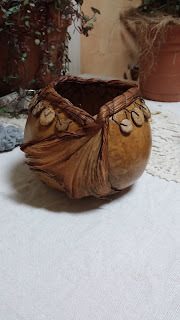 It is made from gourds and cloth. 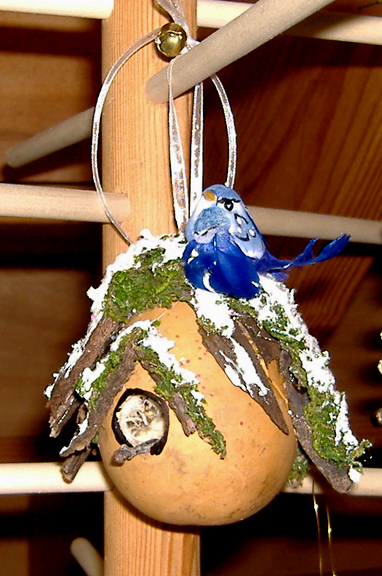 I made the bird's nest from the inside of a gourd and the bird from a nut thing. 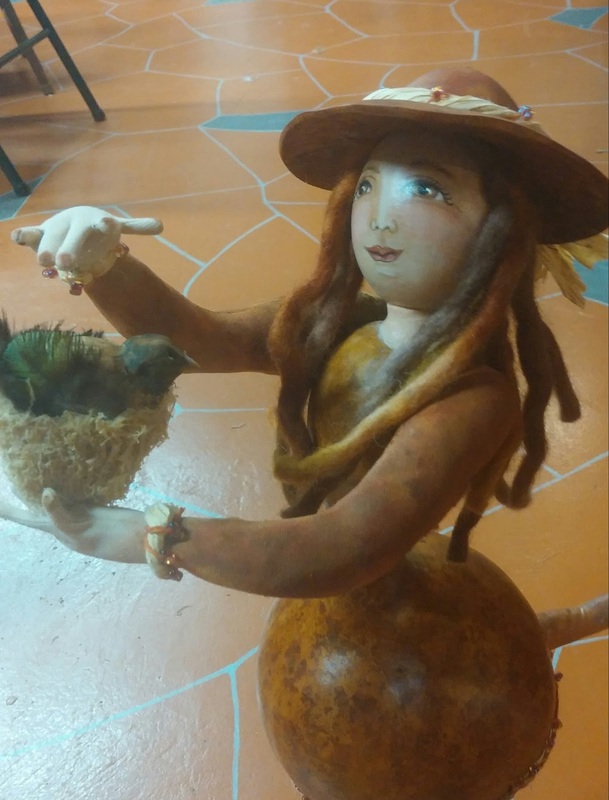 Added paper clay and feathers. Her head is an egg gourd. Her arms and legs are cloth ona wire armature. 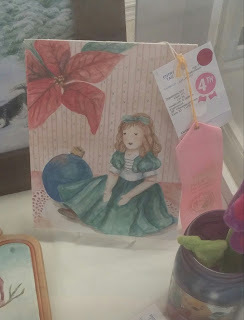 I had been wanting to paint a picture of a doll. This got a fourth place. I did not expect it to get anything so I was ok with that. 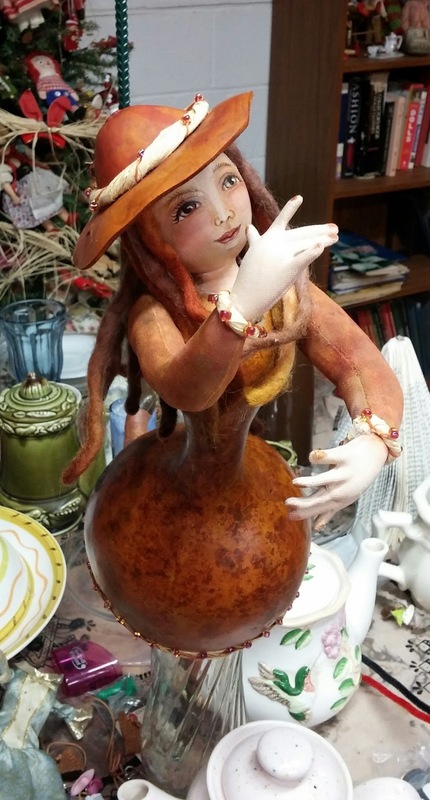 I have been crafting, singing, playing music and clogging. WOW! I took 29 items to the fair this year for competition. I got ribbons on a number of things and was truly surprised to get blue ribbons on plants that I took. I thought the plants were nice but really had no idea that they were that great. I have intentions of putting lots of photos up. 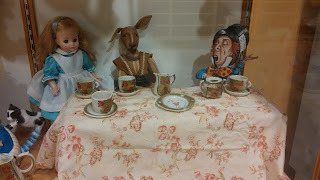 I also need to post photos from last year's fair items. Some people don't understand why I like putting things in the fair. I really love being motivated to get some projects finished and do projects that have been in my mind. Sometimes other things just come first and being creative comes last. So having a good reason to finally make these things gets me going. Yes, the house gets a little neglected. Yes, my husband feels a little neglected. But it is only for a short time and then life gets back to normal. And I end up with some finished projects that turn into Christmas gifts or get sold or sit around my house for me to look at and be satisfied. So, coming up are items that I have made over the past two years. These pictures are from the fair last year. 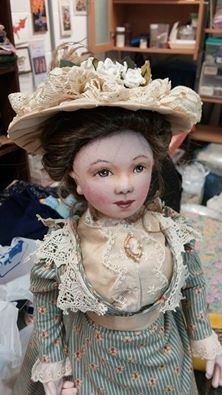 This is a doll that had been waiting for years to be finished. I turned her into a Victorian Fashion doll. She got a third place at the State Fair. They posted some reasons. They were a little trivial considering the complexity of the doll. 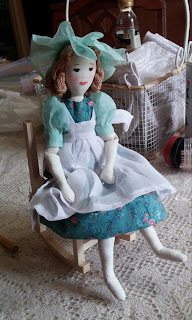 But I'm just happy she is done and hope to someday make her more clothes. This cute little snowman (which is actually around 12" tall) is a gourd. He got a second place... I think. I thourght for sure that this gourd creation would get a first place but it did not. It got second. 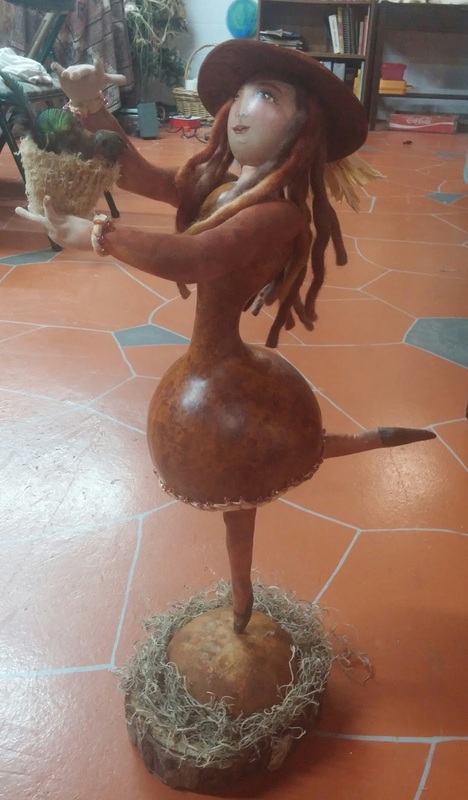 The first place was a wonderful gourd dragon on a giant dark crystal ball. I gave this away. I need to make another.. maybe two for gifts. This is the back of the cat gourd. There is a spider in the front and a mouse in the back. This was done with Sharpie Markers on a glass ball. 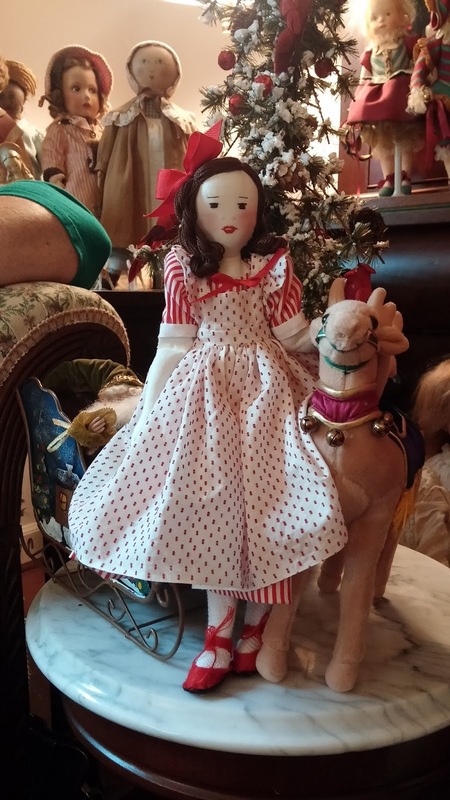 This little doll is a Vintage Horsman doll. I made the outfit and it got a blue ribbon. 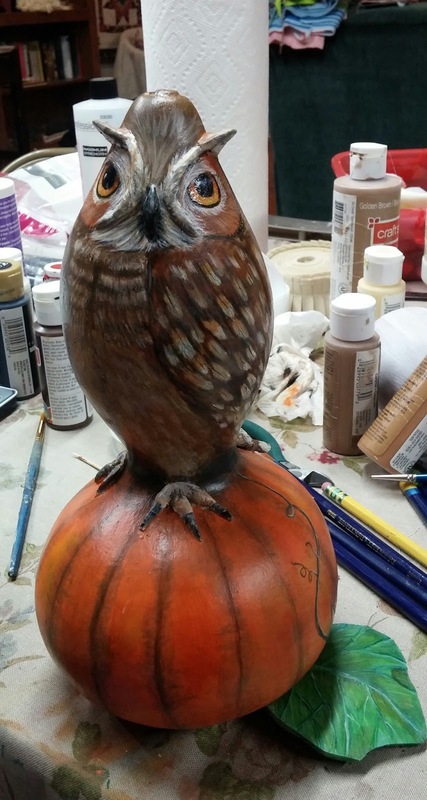 This was a gourd bowl entry. I think it got a red ribbon. 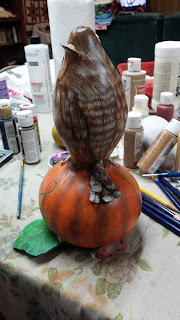 I am always happy when I get gourd things done. This was a special item for me. I really liked the finished project. It got a read ribbon. And someone wrote that they really liked the suggestions in the picture. That was the idea. 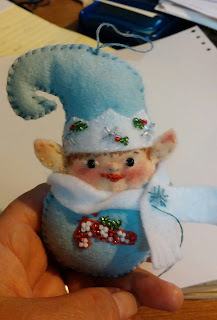 This little elf was much fun to make. It did not go into the fair but I did put another set of three similar items in the fair. They did not win anything. 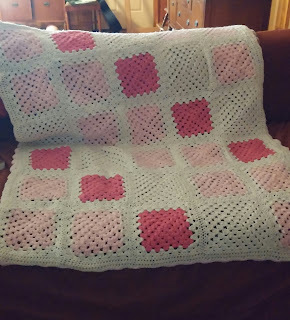 I was so excited to finish this granny square blanket. I had a lot of the squares in a bag I had purchased at a thrift store years ago. I had to make more in order to make a pink one. But I finally got it finished and gave it to one of my granddaughters. 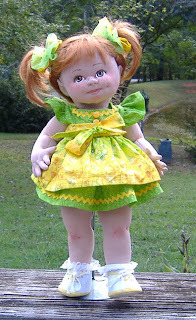 This sweet doll did not go to the fair. 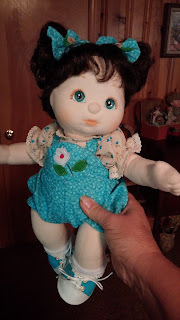 She was in a doll swap. She is a pattern by Edith Flack Ackley (EFA). Her dress is made of vintage fabrics. I got a sweet doll back. 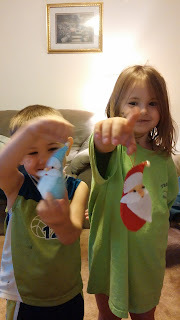 These are two little felt ornaments I gave to my grandchildren. They like them. 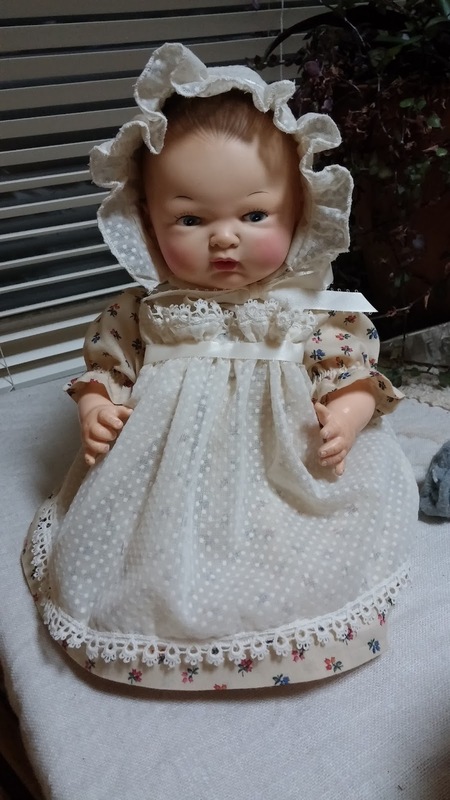 This is a My Child doll. She went to fair to model the little outfit. She got a blue ribbon but I could not believe that someone took points off for her color combination and neatness. I even made her socks, shoes and bows. It has been cold FINALLY! But ... it WAS cold. Today will be in the 60's. Not typical for January here in the piedmont region of NC. I love snow. However, this is the first year that I was almost too afraid to get on a sled. Age does that to a person. The fear of pain and being debilitated overrides the enthusiasm of fun. I did get on a sled and go down the hill one time last week after our first real ice storm. There was no snow but there was enough ice to go sledding with a flat bottom plastic sled. So I did go down - once. Maybe if there had been some soft fluffy snow to fall into I may would have been more courageous. Anyway.... I wanted to show you my latest pride. I have been meaning to do another sketch of my sister's grandson. The photo I used is about 6 years old. But it is such a heart warming photo I wanted to do an artist rendition. I scanned it in, did some editing in photoshop and using a number of special techniques then printed out just the most vague rendering of outlines. That way I can do all the rest by hand. The hardest part (for me) is getting all the setup and proportion correct. 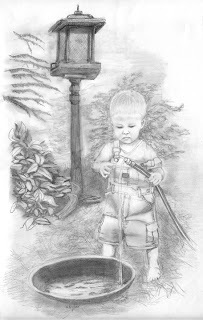 So, after using pencils, charcoal and a few other artists sketching tools I ended up with this. Notice that I moved the bird feeder around for more balance. Although I think i would have prefered it to be out of the picture altogether. I scanned the finished product back into the computer which was a little difficult because I printed it out at 17" high. Then I added a layer of color just to see if I prefered it in color. Also, my sister had the opportunity to chose which one she prefered. Now I will print out the black and white one onto watercolor paper and use watercolors to paint it. It will look much better than the color rendition above (hopefully). Tell me which one you would prefer. It looks as though I manage to get around to updating this blog about once a month. This month I am happy to state that my doll last posted won first place and Best in Show at the NC State Fair. I was very surprised about the Best in Show and of course very pleased as well. My other two gourd entries received second place ribbons. I need to try a little harder next year I think. At this point in time my once a month Christmas craft party has turned into every Monday night and we are busy making Christmas ornaments to give as gifts. Seeing what others do to the same craft is very inspiring. We have so far made my favorite (and my sister's favorite too!) ornament the egg gourd bird house. I grow the egg gourds and the roof of the birdhouse is basically pieces of mulch. 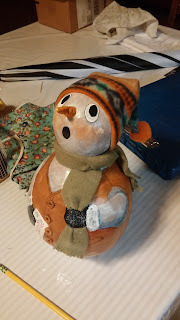 The bird came from Hobby Lobby as did the 'snow'. I think I will keep this one as it is my favorite one so far. 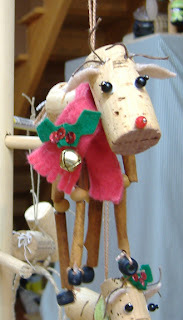 We have also made little Reindeer from bottle corks. The model my daughter lent to me had legs made of jute cording. But I used cinammon sticks. 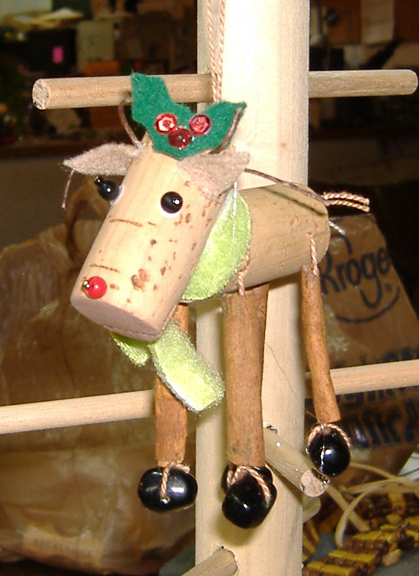 The little hooves are beads. Here is another one. I made jointed cinnamon stick legs but it did not seem to make much difference and was harder. So back to the plain legs. 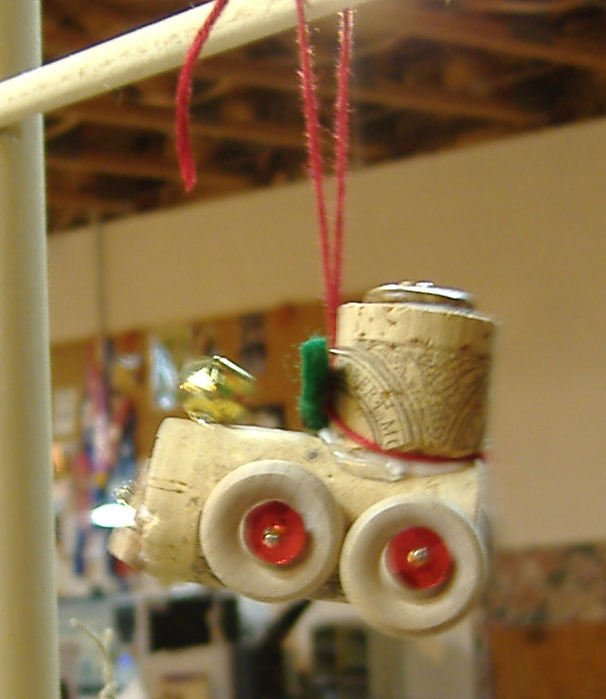 While I was crafting with the corks I got the bright idea to make a train engine... Here is the result. There is a jingle bell for a smoke stack and the front grill piece (which you can't really see in this picture) has sequins and beads for lights. Sort of small. But cute. I also made something outside of the Christmas craft parties that is rather smart. I saw one that my sister Melody had made and since I had been needing one anyway... well,, there you go. 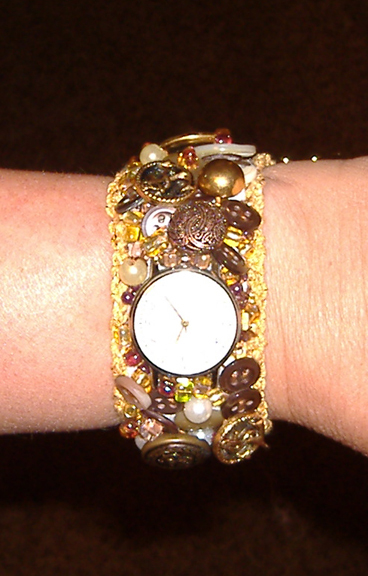 It is a watchband made of elastic and covered with buttons and beads. Although the first picture is a little blurry, hopefully you can still see the result. I also crocheted a little border on either side of the elastic. I really like it and I received a lot of compliments on it when I wore it. But I used button and carpet thread to attach the embelishments and once the band got wet (oops) the buttons started coming off when they were snagged. I am going to have to start replacing them with 100% nylon upholstery thread as that will not break! And that was a lot of work to have it start unraveling. In fact, I was at a party and was chewing a grape when I bit into something hard. Thinking it was a piece of a grape seed I spit it out. But it was a little amber bead. Oops. Yea, time to remake that thing. I bought a couple more watches at a yard sale and want to make a couple more from another color beads. It's been a long time since I last posted. Life goes on. I love my grandchildren and I have lots of opportunities to be with them. I guess it just really keeps me busy. However, I still seem to have had time to make a few creations which I put into the NC State Fair. I was also able to help my 9 year old granddaughter make some things which she put into the fair. 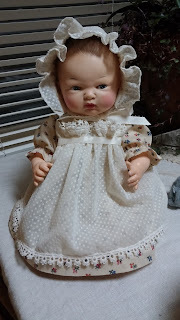 This is the doll I made. It comes from a pattern I found in the Soft Dolls and Animals magazine dated 2007 and created by Darlene Rausch. 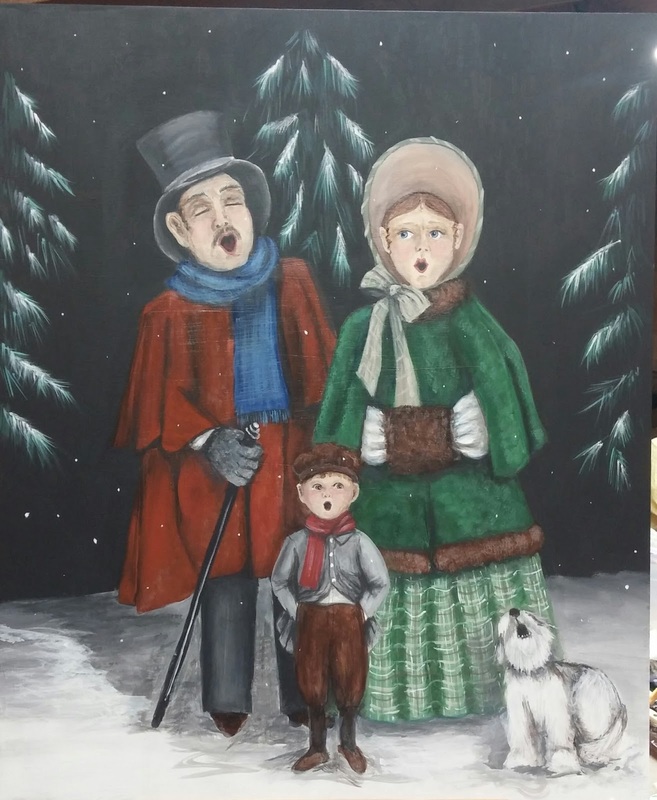 Darlene is a yahoo group friend and is very talented. The came close to looking as sweet as Darlene's but maybe a couple more tries and I'll actually get it right. She won a blue first place ribbon as well as a great big Best of Show ribbon. I think the Best of Show is intended for the toys and handcrafts category under the "SEwing " heading. It's hard to know really. But I was pleased. She is wearing a wig so I made everything but her hair and socks. 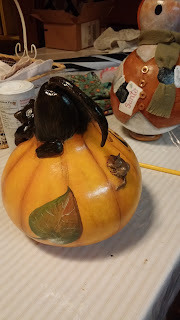 The next picture is of the gourd creation I made which went into the category of "Gourd Creature". It won a red ribbon. 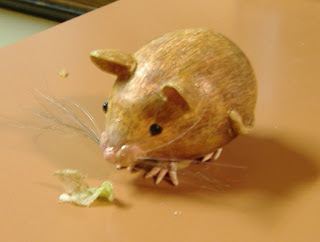 It is made from an egg gourd with paper clay ears, nose, feet and tail. 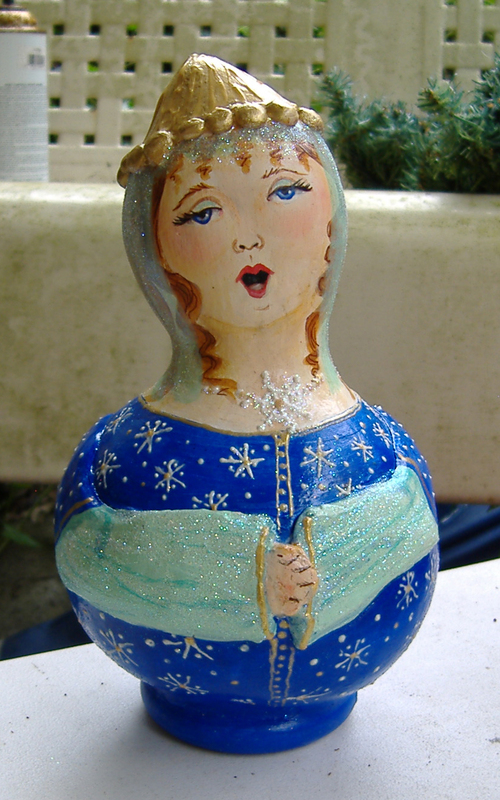 The last pic is of the gourd singing lady. I seem to do at least one of these every year. This is not one of the best I have made. But I procrastinated and then had to hurry to finish. She has some endearing qualities though.